Talking about this with non-car folk at the weekend and someone made the comment that the 2018 Regs will require emissions of any Diesel to be within limits for that vehicle when new. I am taking that with a large pinch, but if true it would endanger our remapped Hdi90 which does smoke. I have just bought a 56 A4 3.0Tdi which was built without DPF. Didn't become standard fit on those until 2008. Need to find out if it's safe to get a remap on it. I do believe their is some truth in what the person said. 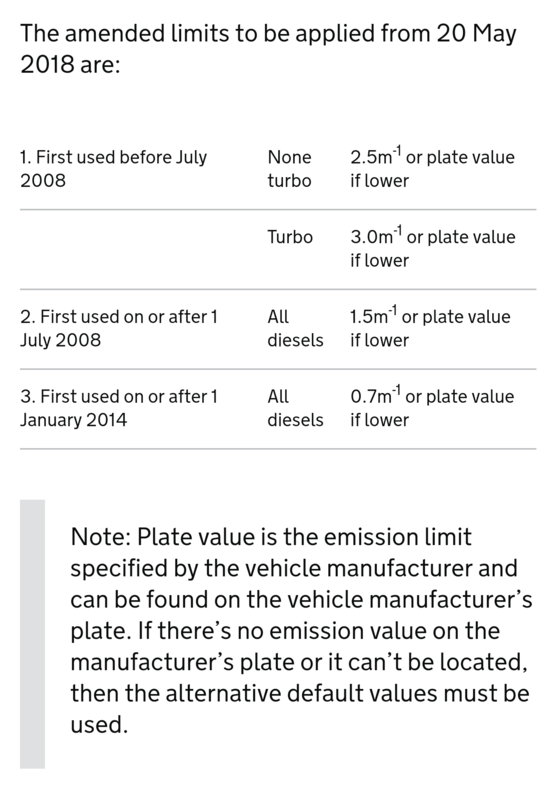 My passat which is a 2005 euro 4 and non dpf has said plate figure of 0.60 which is less than some dpf equipped cars state on the plate.so if your 2000 as an example diesel has a figure on the manufacturers plate and it's lower than the given limits mentioned above it will have to meet it. So I for one am not taking it with a pinch of salt and I am like lots of people genuinely concerned. While it's had yearly fuel system cleaner through it and I'm using 2 stroke in every fill up with BP ultimate diesel and the remap have all brought the smoke levels down its still a diesel and there's no getting rid of it all. Do you know what your test results are? I know I had thought the same but it's also an immediate fail if the sticker or plate has been removed or tampered with according to the draft put out on the .Gov website. Last year it was just under 1.0 if I remember right, but this was before using 2 stroke every tank so hopefully this year it will be lower. This is true the stock map on the awx is terrible, smokey and with an awful torque spike. The current map I have on cleaned it up and flattenes the spike and allows the car to pull right up to the red line where as befit it was all done by just over 3k, 70 to 100 mph is something else I couldn't believe it. 2.2hdi with no FAP, or EGR, mapped to 175bhp, 30 - 70mph was something rediculous like 4 seconds. Blanking the egr on the passat worked wonder too. Shocking to think that VAG engine maps might be anything other than perfect. My bro sent me that link a week or so back, there are 37 VW graveyards like that apparently. He thinks it's terrible (he drives a, affected Pisshat), all I can think of is driving a tank across them. Apparently in the US they're given the option of a retrofit pig piss system or a refund (I guess that's the popular option) but in the UK they just seem to be downgrading the map to hold the EGR open longer (which then dies in an expensive manner) and ruins the fuel consumption. My bro is not a happy bunny. Luckily mine is a b5.5 with the pd engine, before all this nonsense started. Definitely been the best family car we've had by miles. Although I do think the US has blown it way out of proportion especially when you see what their huge pick ups are chucking out, but that's OK their classed as commercial vehicles so they don't need to hit emissions levels. Is that on the VIN plate? Yeah bottom right hand corner of the sticker I doubt my passat would have been able to blow that from new.